There`s so much going on in this granola, it`s hard to know where to start. It`s multigrain, so it`s got oats like a normal granola, but Rude Health also add some spelt and barley for a more complex, grown-up flavour. The subtle sweetness comes from a blend of honey and date syrup. That sets off the cheerfully crunchy seeds, toasted nuts and puffed amaranth. Enjoy as a healthy snack or sprinkle it on thick greek yogurt and top with fresh berries or sliced banana. 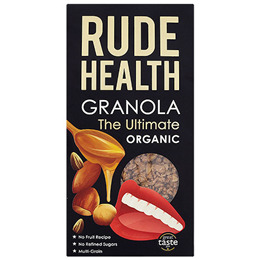 Below are reviews of Rude Health The Ultimate Granola - Organic - 500g by bodykind customers. If you have tried this product we'd love to hear what you think so please leave a review. There`s so much going on in this granola, it`s hard to know where to start. 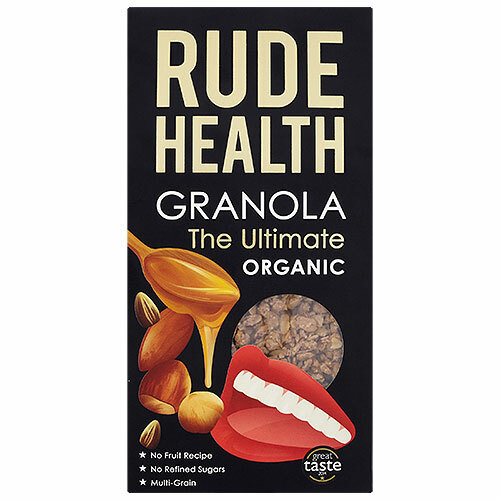 It`s multigrain, so it`s got oats like a normal granola, but Rude Health also add some spelt and barley for a more complex, grown-up flavour.